It is some time since I had the opportunity to post on here. The commercial side of ty photography business has been very busy doing my ‘Cadet Shoots’ which is really nice as it means that I get to donate some of my earnings straight back to the Cadet unit and therefor the kids themselves…..and I earn enough money to eat! I spend a lot of my time in town during the day. I enjoy the ‘coffee culture’, having a chat with my friends and also doing a bit of work in the sunshine. I always have a camera with me, usually my Olympus Micro Four Thirds (MFD) OM-D E-M5. I love its compact size, electronic viewfinder and solid Olympus build, so reminiscent of my original OM-1n film camera from when I first started my career in photography. Trouble is, it’s so difficult to get inspiration when you see the same thing each day. But sometimes you just need to take a walk and make a conscious decision to get the camera out of the bag, look for a composition and take a shot. 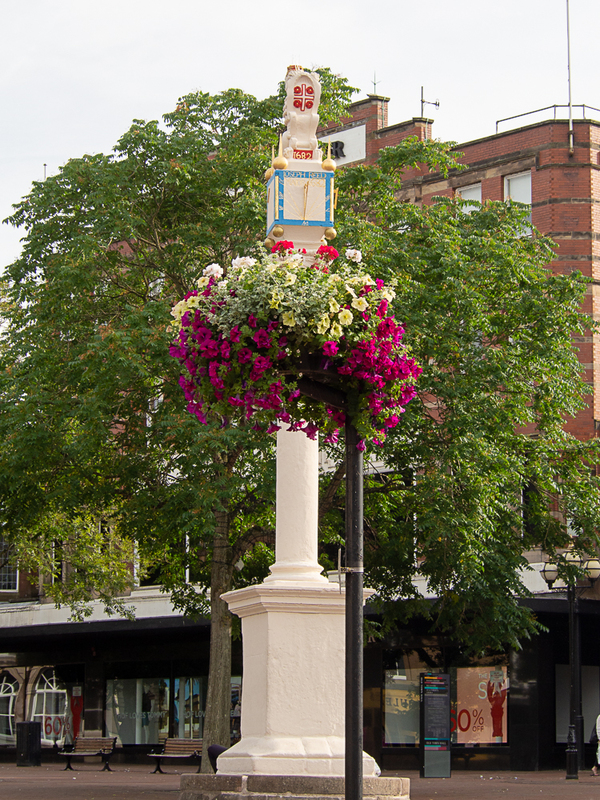 Mentioning this to David, one of the “coffee crowd” he looked up and suggested lining up the colourful hanging basket with the market cross and the tree behind… so I did. Nice. “Get in close and fill the frame” that’s what my photography teacher used to say at school. And so, with that in mind, off I went. A good friend, a well established and respected contemporary artist, elaborates when in conversation on her style as centring on the abstract. So after I started off with abstract in mind. 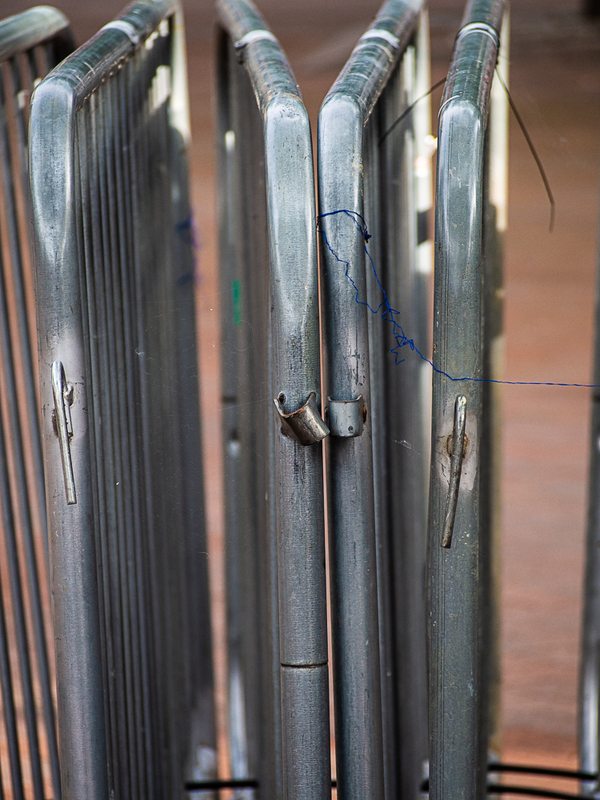 First thing was a rather unexciting collection of street barriers. How on earth do you make them interesting? get in close and use the lines and reflection. Next along the street were the walls. I don’t know how many thousands of times I’ve walked past these two pieces of wall without ever noticing the potential. Something as simple as a painted fire hydrant sign takes on a significance when it becomes the star of the show, or in this case, the star of the shot. The writing has been here, protected by an overhead causeway, for well over 50 years and is part of the history of the building. Into the church grounds of St Cuthbert’s church and a simple brick wall takes on a different persona when a small piece is seen in abstract. 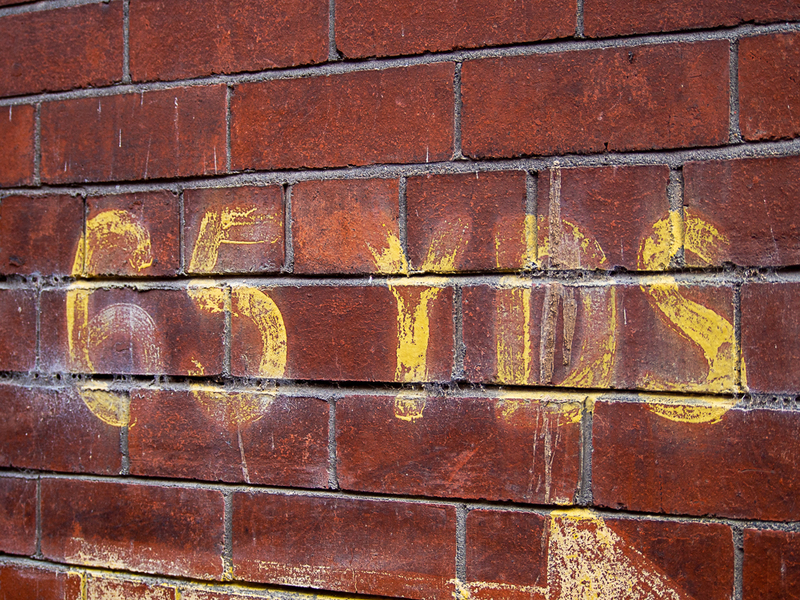 You naturally think of red bricks when you think of a brick built wall. But the multitude of textures, shades and colours turn an old wall into an item of interest. 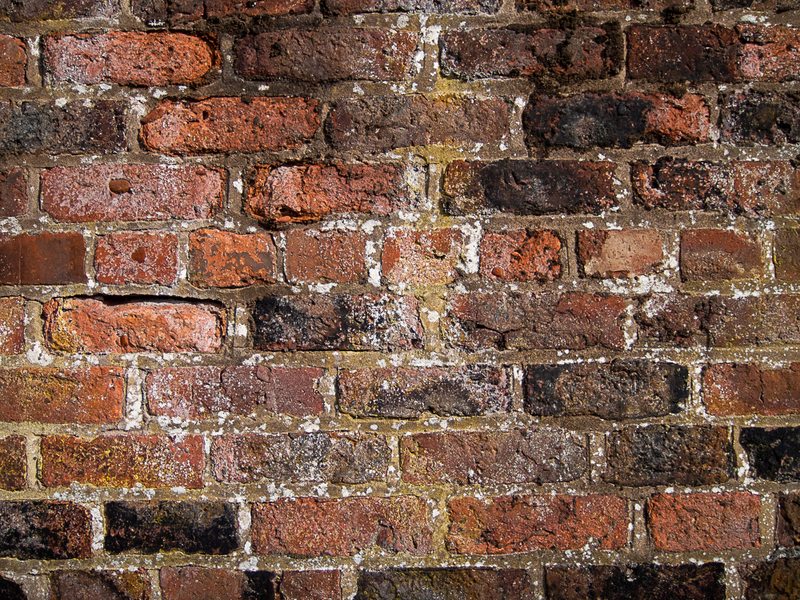 The weathering of certain bricks and cement only seems to take place in small areas while other parts appear almost newly laid. 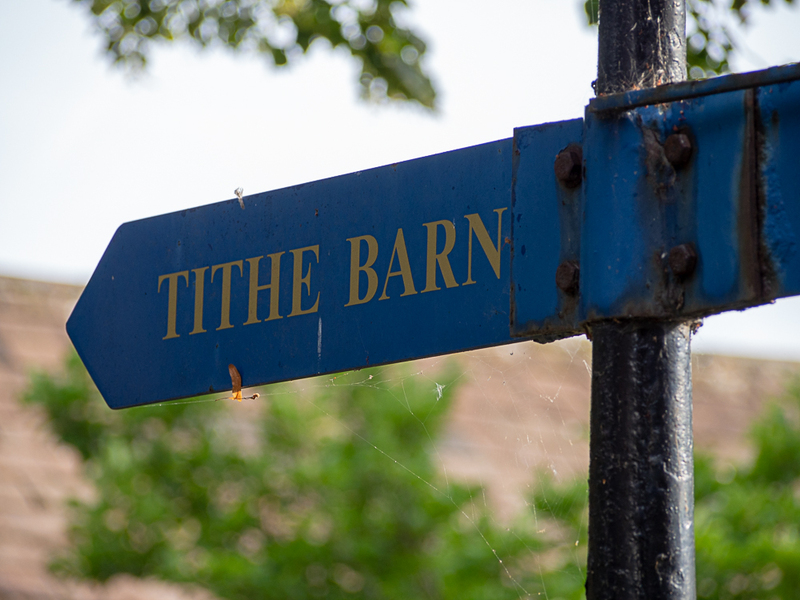 Moving on through the grounds and a sign post pointing the way to the old Tithe Barn shows its age with the rust on the fastening bolts appearing to froth with a covering of brown iron oxide which streams down the blue of the sign appearing to almost drip off the bottom edge. Adding to the rustic charm of the sign, the cob webs can be seen spanning from the blue direction arm to the post providing a home to the spider and a deadly trap to flies caught in the wind. Walking along to the end of West Walls and I got to the Millennium Bridge. 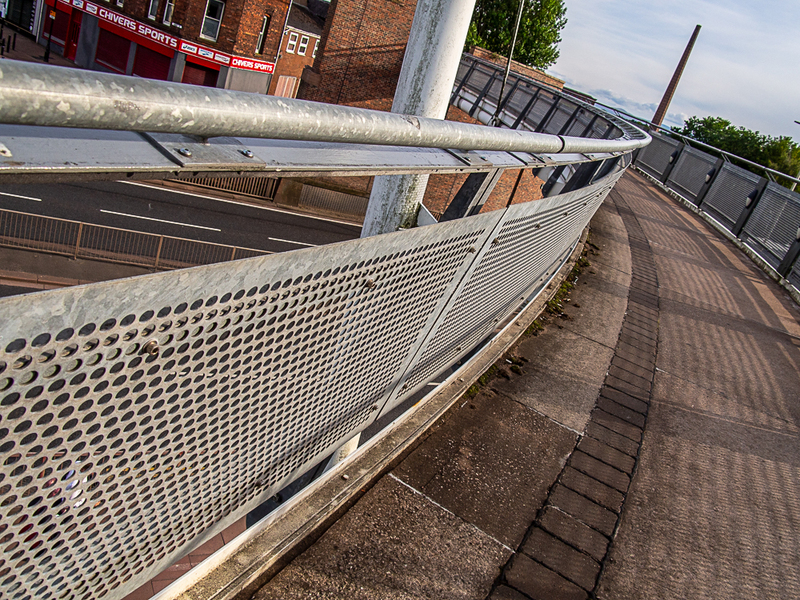 A legacy of the investments made in many UK cities for the new millennium of 2000. 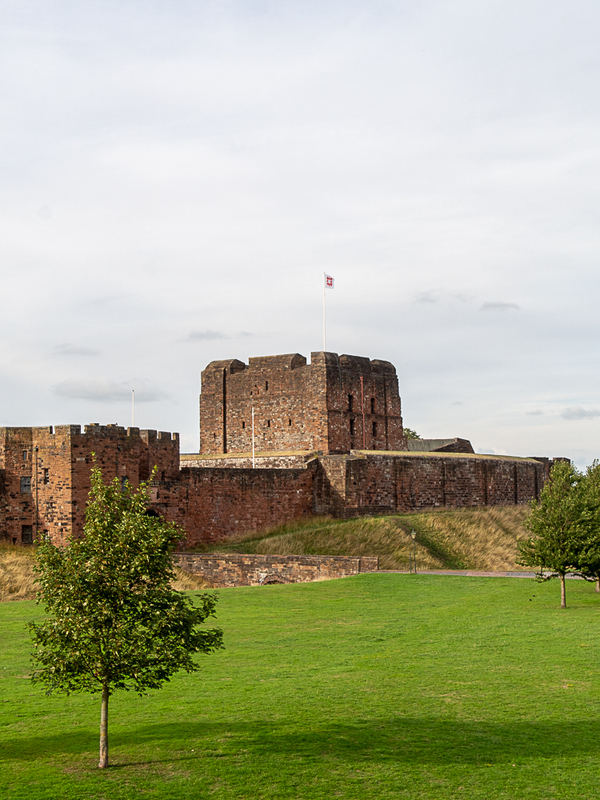 Although it has been standing, straddling the dual carriageway which splits the city from its castle for some eighteen years now it is the first time I have been upon it. Designed, allegedly, to represent a bow and arrow (don’t ask!) the bridge takes on a crescent shape. It was rather interesting in itself especially when following the line of the crescent drawn out by its zinc galvanised hand rails stretching out to the Castle in the North and the shops on Abbey Street to the South. Again, getting in close and a bit of a ‘Dutch tilt’ made a more interesting shot. Being up on the bridge also gave the opportunity to see one of the most familiar building in the city, the Castle, from a different and pleasing angle. 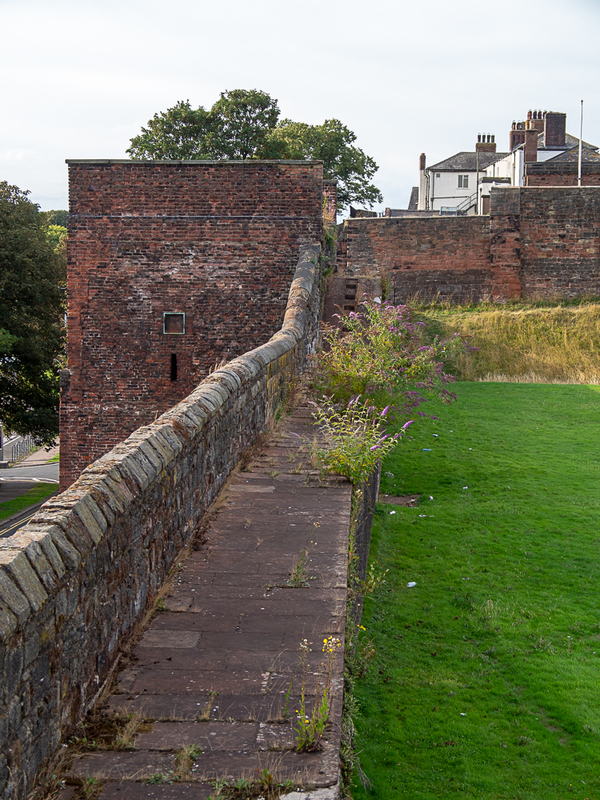 The view along the original city wall with its rampart walkway, leads to the castle walls. You can even see the steps, cut into the walkway as it rises by the access building. 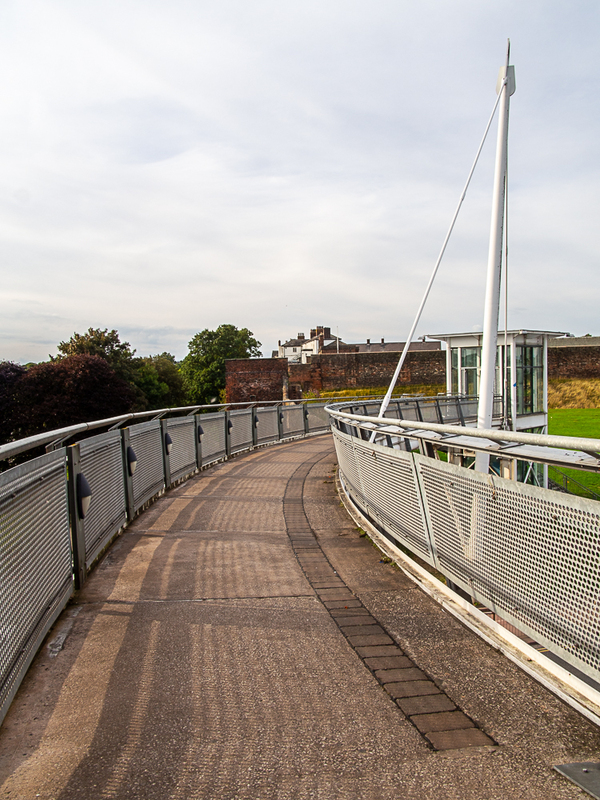 The grounds to the right now part of the open approach field to the castle moat, the other on the left dropping sharply to the Devonshire Walk car park. 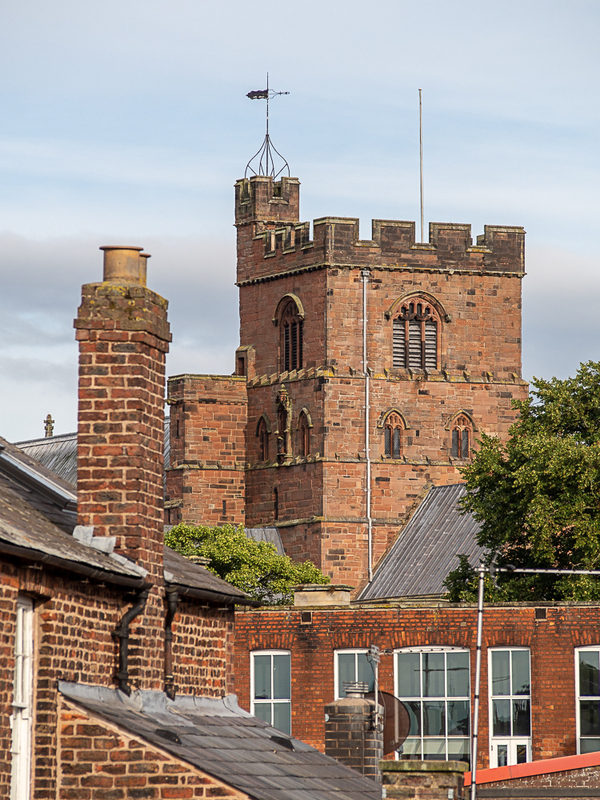 Turning to the right and the familiar….but different, view of the front of the famous Carlisle Sand Castle standing majestically defending the North of the city. Now controlled by English Heritage it is still an active military barracks for the Border regiment and the Cumbria Army Cadet Force. The sturdy walls give the impression of being impregnable. 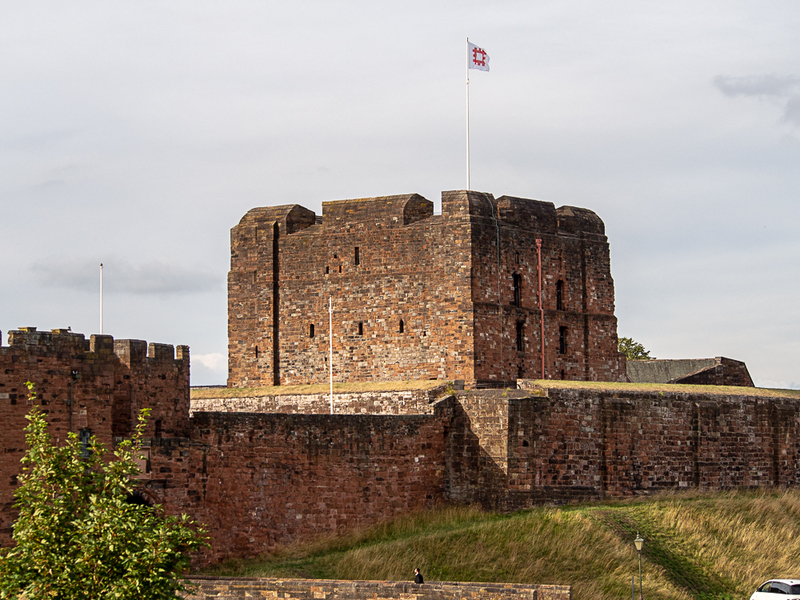 But a walk along the main (indeed only) road to the castle allows the public to enter through the heavy portcullis gate and into the main Castle grounds where the Cumbria Museum of Military Life can be found along with the branch of ‘John Watt’s Coffee Shop’ can be found for light refreshments. Looking back over the bridge takes me back to the city where the magnificent Norman era Cathedral can be seen peeping over the shops and houses on Abbey street. One hundred years ago the spot I’m standing on would have been the roof of a row of terraced housing across from Annetwell Street, now only a one sided street but the home to BBC Radio Cumbria and the main entrance to the Tullie House Museum. The Cathedral rising from the rooftops does nothing to give away it’s huge scale when vied in its own right. In fact from this view it almost appears insignificant. Again, this is a viewpoint I have never see before giving a new perspective to a well known subject. It certainly was well worth getting the camera out of the bag and shooting something for my fun again rather than the work shots I’ve been doing recently.